A fresh-flavored sauce made using tomatoes from Italy along with onions and spices. 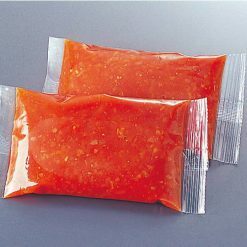 Simply defrost the sauce in its bag to enjoy with spaghetti, meat, vegetables, and seafood dishes. Ready-to-go authentic tomato sauce, made using tomatoes from Italy. 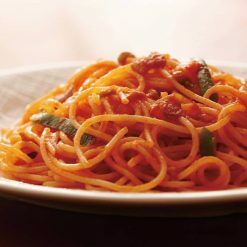 Tomato sauce is all you need to turn plain pasta into dinner, and is a great sauce to have on hand. It can also be used to make your own pizza, lasagna, or eggplant parmesan. Seasonings such as sauces can be a crucial part of a meal, turning plain food into a delicious experience. After all, sometimes we only think we don’t like certain foods because we haven’t tried them with the right seasoning! Sugarlady’s tomato sauce and other seasoning products are safe and free of chemical seasonings and additives, letting the true, natural flavors of the ingredients themselves shine – and allowing you to enjoy your meal without worry. How to defrost: Place the tomato sauce (still frozen, still in its inner bag) in boiling water, and heat for 5 to 6 minutes to defrost.How to eat: Can be used as sauce for a wide range of foods, including spaghetti, meat, vegetable, and seafood dishes. Use it with ravioli, meatballs, or pizza Margherita for an Italian experience, or with French toast, ratatouille, or Indian-style curry for international variety! This product contains tomatoes, tomato purée, rice-bran oil, sugar, dehydrated onions, rice wine for cooking, rice vinegar, chicken extract, garlic, rice starch, table salt, spices.. This product is not suitable for anyone with allergies to chicken. Origin of ingredients: tomatoes (Italy). Prepared and packaged in Japan.